We’ve been back for almost five hours, and I’m still not sure what to write. I was actually supposed to submit my blog on Friday, but that didn’t happen. So let’s see what I end up writing about. This has been my third Associate Collegiate Press conference. 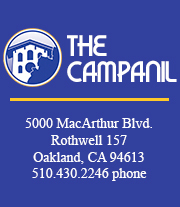 I’m lucky enough to have been a part of The Campanil staff for all of my three years here, and I’m lucky enough that those planning ACP (usually the EIC and ME, a job I did with Ari this year) have budgeted enough money to let me attend. So this year, after months of planning on my and EIC Ari’s part, the whole editorial staff of The Campanil packed up and went to Los Angles for a weekend. This year I could tell that there was something invigorating about this staff. We had placed in four award categories in the CCMAs and four of us spoke on panels, and unbeknown to us until we were at the airport leaving, we had placed 6th for best non-weekly newspaper, nationally! Nothing like years past where we have been lucky to scrape by with one or two “eh…decent” awards and maybe someone on a panel. As I was riding in Sports and Health Editor Jen’s car on the way back to Mills from the airport, I realized just how special this staff is. It’s not every year or publication or whatever where 13 people are able to not only get along, but also to truly support and care about one another. It’s not every year that you’re disappointed because you can’t make it to a sports panel when all you want to do is investigative news. And it’s not every year when the entire staff shows up at your (and two other staff’s) panel on queer reporting no matter what they identify as. Some say 13 is unlucky. And for some that may be true. But I’ve always loved the picked-on number, and this year, with 13 lovely people on our editorial staff, it seems to be a lucky year.